Chicago Decking Wanted to create a relaxing atmosphere for their hardworking employees. 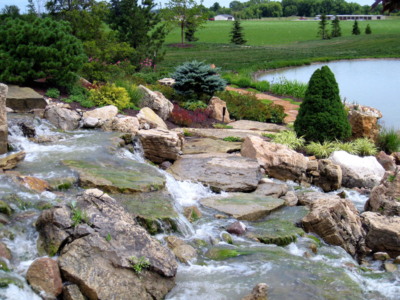 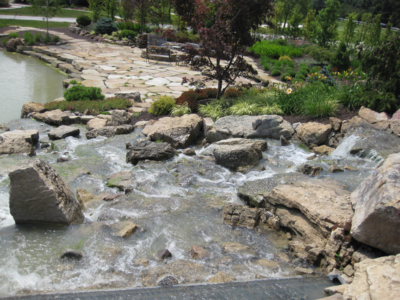 The design includes two separate 15 foot wide waterfalls, the longer of which is forty feet long and both are over twelve feet high and pump approximately 60,000 gallons of water every hour. There is even a hidden walkway across the rushing stream made from large boulders. We also installed a large patio complete with a fire pit. 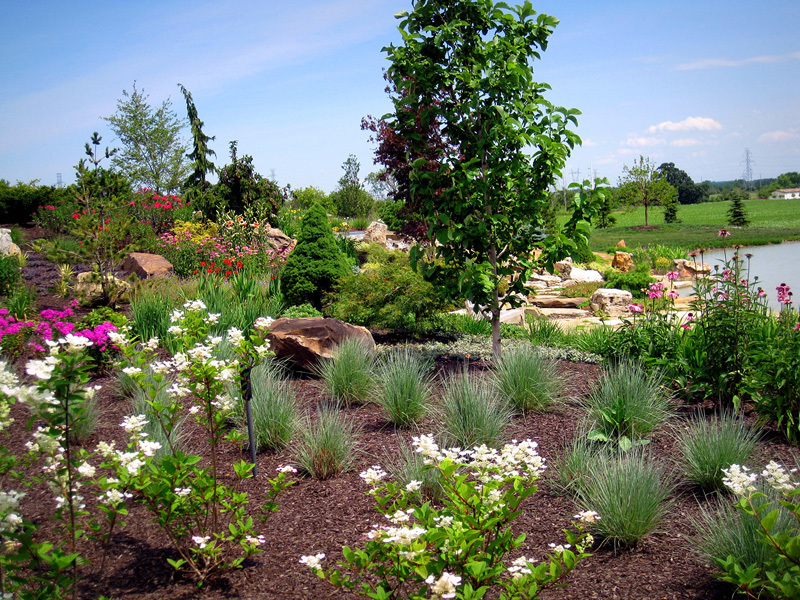 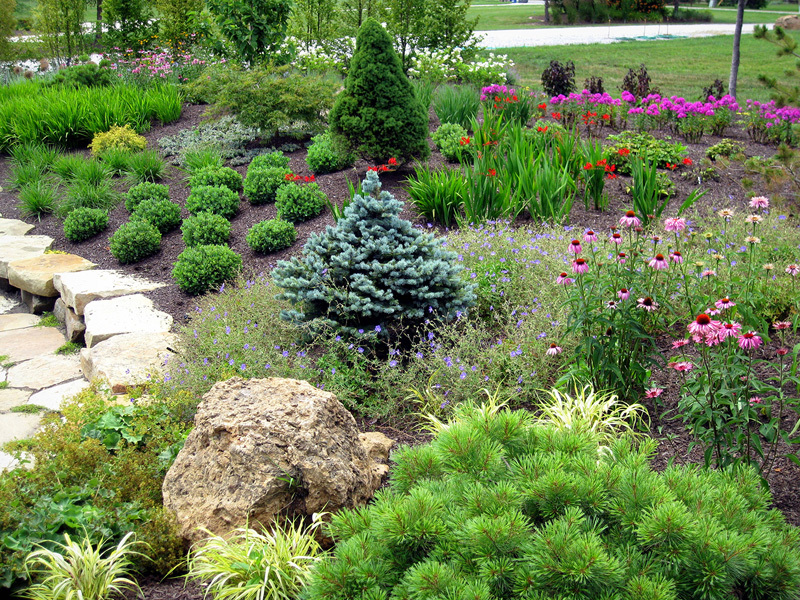 The landscaping includes Japanese Maples, A Weeping Alaskan Cedar, a European Hornbeam hedge, unusual evergreens, grasses, and hundreds of varied perennials. 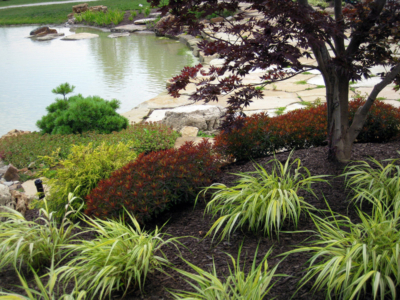 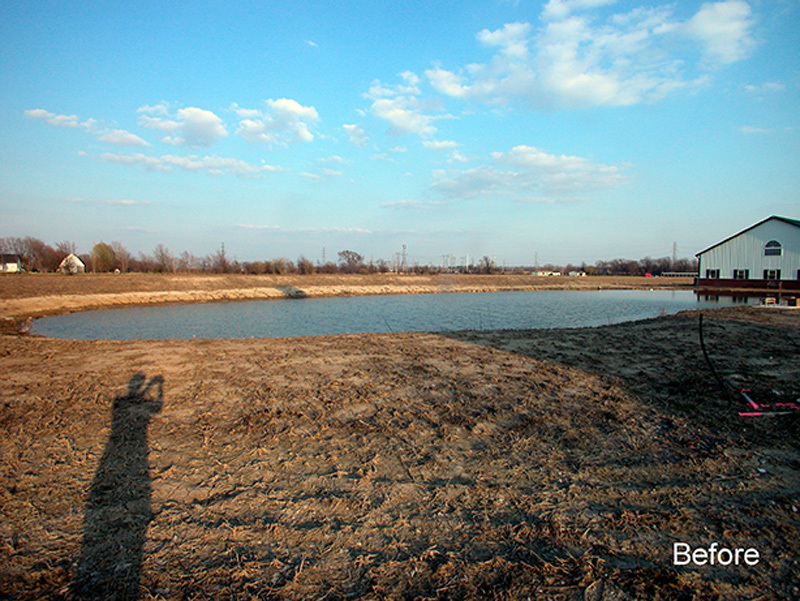 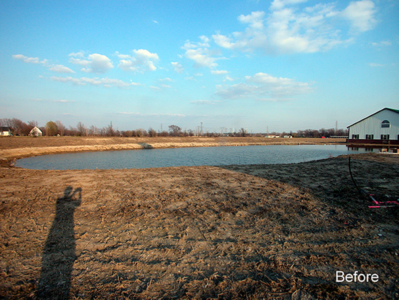 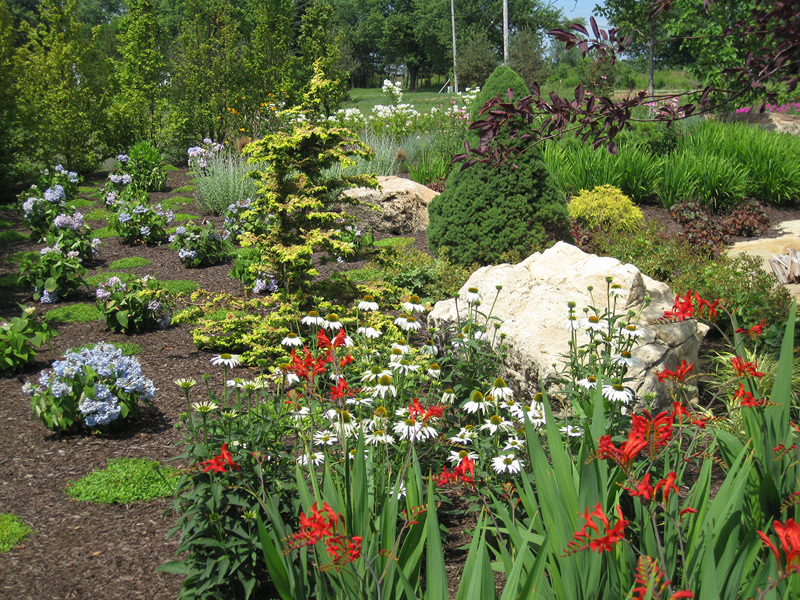 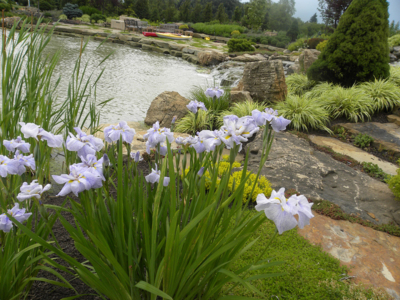 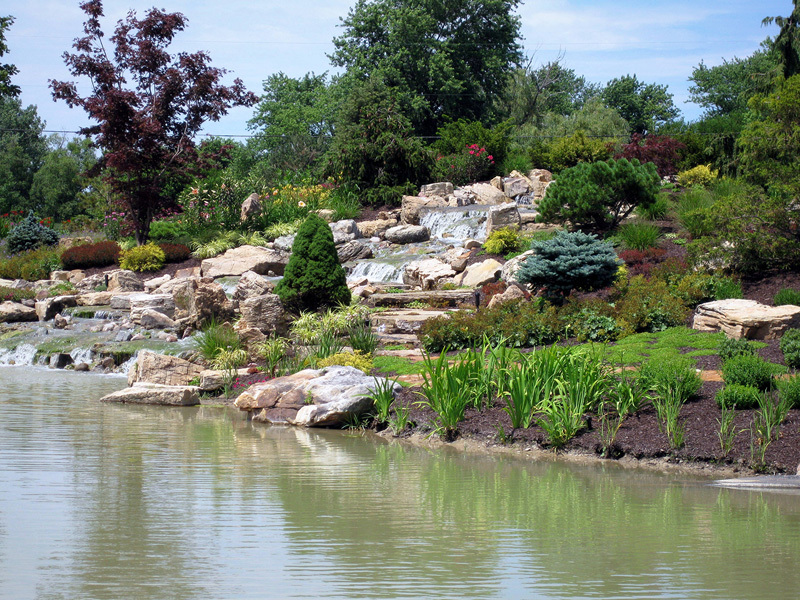 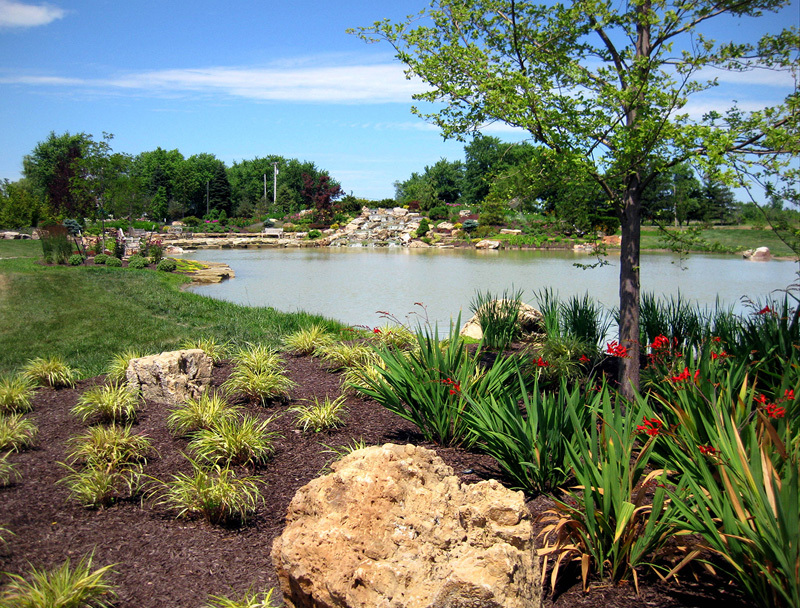 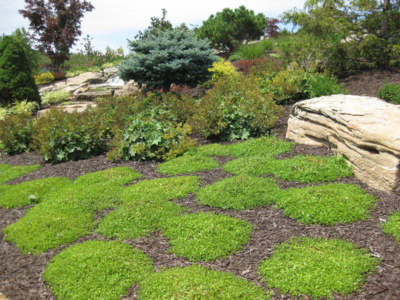 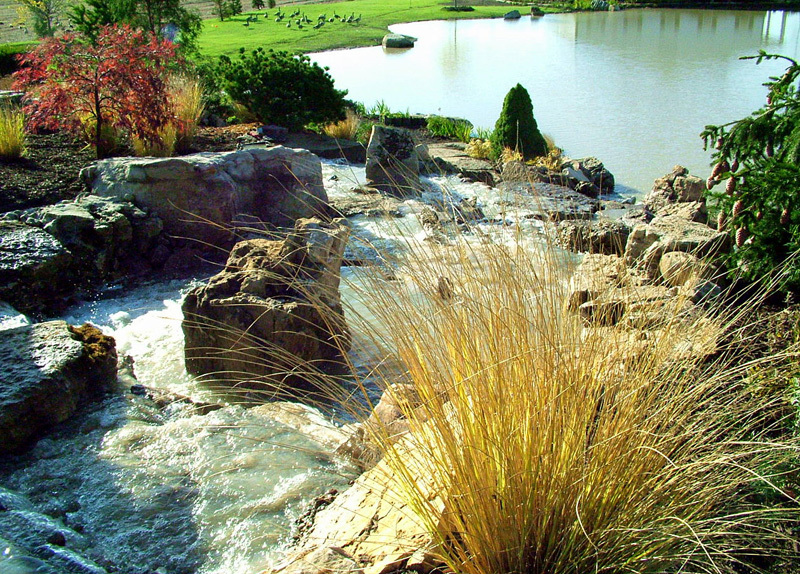 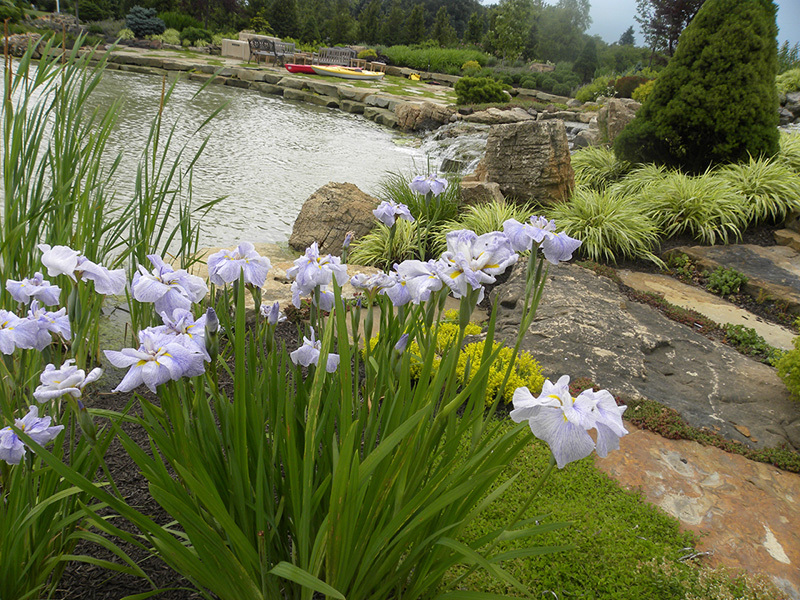 Together the design is in harmony with nature, providing aeration for fish in the enlarged 3/4 acre pond and attracting hummingbirds and butterflies through the plant selection. 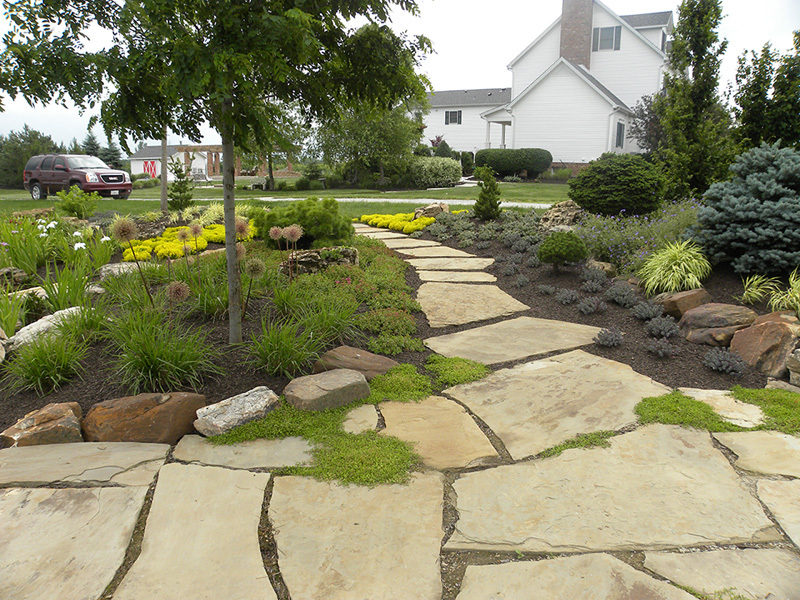 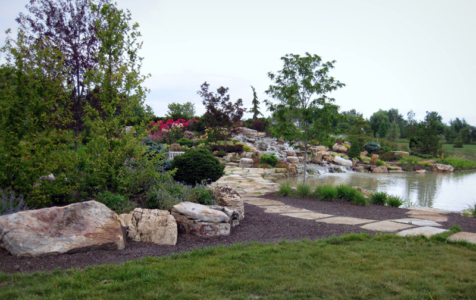 The build included flagstone from Utah, boulders from Michigan, and Wisconsin Cobblestone. 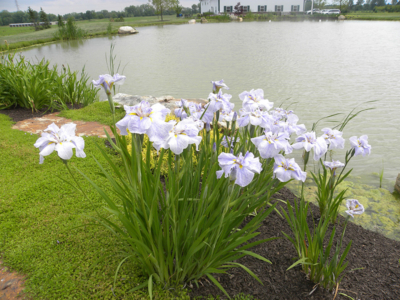 The plants are sourced from all over the country. 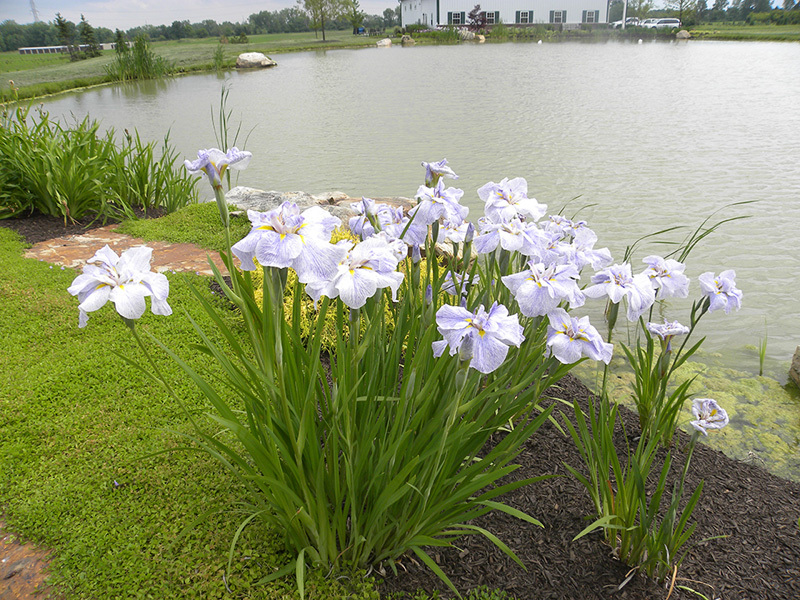 Two 5hp pumps were installed with 100 amp service which also powers decorative lighting. 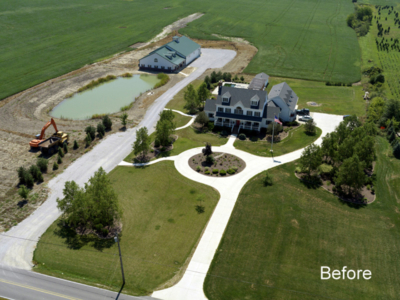 We were responsible for every aspect of the build. We performed all project management duties from the design studio to putting the finishing touches on a one-of-a-kind, award-winning install.